Tinder created a feature called ‘Smart Photos’ as a way to A/B test your Tinder profile photos. But should you be using Tinder Smart Photos, or could it actually be harming your match rate? How does Tinder Smart Photos work? How long does it take to get results? We’ll be answering these questions and more. What does Tinder Smart Photos do? 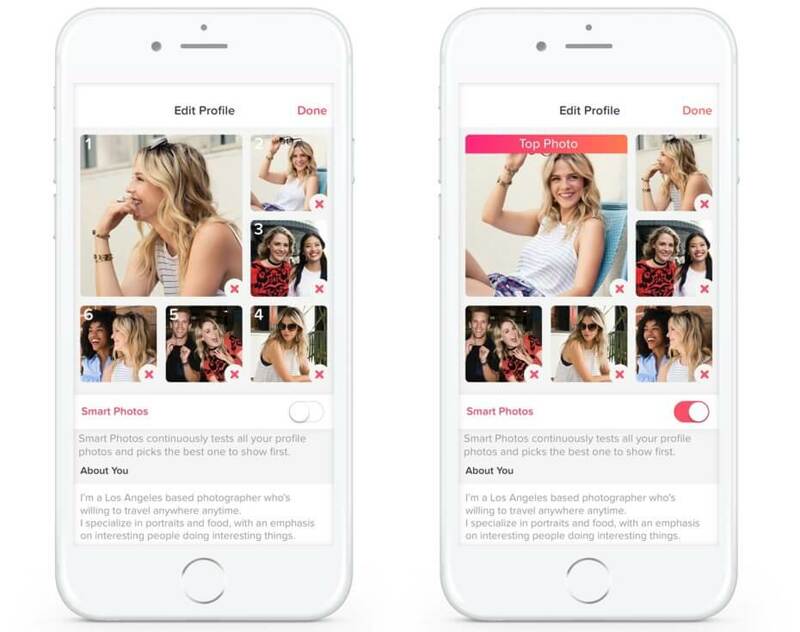 Basically it rearranges your photos based on which photo is likely to get a right-swipe. More specifically, Smart Photos will note which pictures people were looking at when they swiped right, then put the more successful pictures closer to the top of your profile. How long does Tinder Smart Photos take to work? Maybe you’re wondering why you don’t have a Top Photo yet? 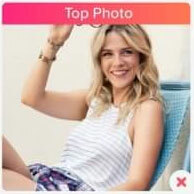 When Tinder Smart Photos first launched, users would receive a “You have a new top photo!” message and a “Top Photo” banner overlaid on the winning picture. It sometimes took weeks to get, and it sometimes changed after that. However, Tinder discontinued this. So instead, now you never receive a definitive Top Photo. Instead, you may just notice that Tinder has reordered your pictures from time-to-time when you tap the button to edit your profile. Should I use Tinder Smart Photos? Chances are, you’re not drowning in right-swipe data. Especially if you’re a male, your profile gets left swipes the vast majority of the time. This means that the rare right-swipe is the only time an algorithm can learn about what works. But since you’re probably not generating a heavy stream of right-swipe data for it to work with, it’s making statistically questionable decisions based on tiny data samples. On the other hand, the photo testing tool Photofeeler provides data every time someone looks at your picture, not just when they swipe right. Did they swipe right because of your primary photo, or because of photo #3? Or because of your profile text? Testing your whole profile at once pollutes your test with numerous other variables. 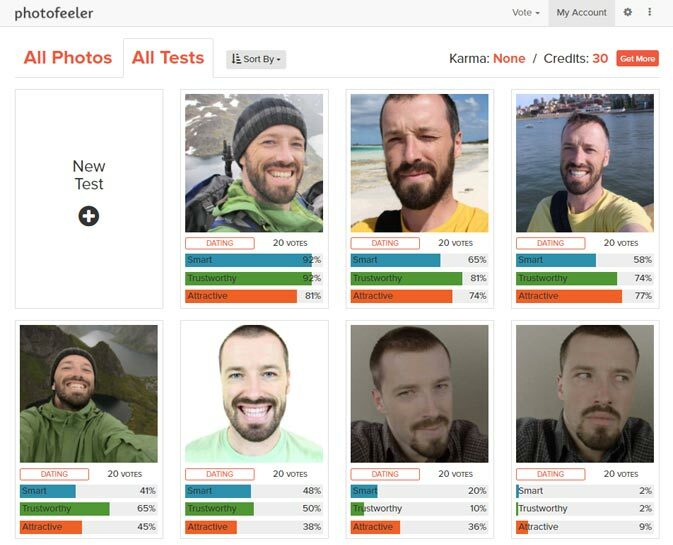 Photofeeler gives you independent feedback on each photo. Okay, so women don’t like your new photo, but why? Maybe you look hot, but untrustworthy. Maybe it was just cropped strangely, or there’s something in the background that’s a red flag. Photofeeler tells you exactly how you’re coming across in photos, and users leave notes to help identify specific problems. As Tinder’s Smart Photos experiments with your profile, it is by nature showing inferior versions to dozens of people who might have been great matches! Don’t waste these match opportunities! Test your photos BEFORE you use them live. One of your photos got a right swipe, but maybe that user swipes right 30% of the time. An approval from a 2%-right-swiper should be much more valuable. Tinder explicitly says they’re just counting right swipes and not taking into account voter style or anything else. Only Photofeeler‘s machine learning algorithms adjust to the specific behavior of voters to value the votes appropriately. Smart Photos compares your own photos to each other, but Photofeeler tells you how your photos stack up against the competition. Tinder says Smart Photos led to a 12% rise in matches. Photofeeler users report 3-5x (200-400%) increases in matches! While Tinder Smart Photos might have some utility (mainly since it’s already baked into Tinder), for choosing which photos to use in the first place, you’ll be better off using Photofeeler.com.